The blasphemy law in Pakistan has been the focus of a heated debate yet again, after a 14 year old girl was accused of burning pages of Noorani Qaida, a lesson for Quran. Rimsha Masih, was arrested on August 17, 2012, after an angry mob of over a hundred brought her to the local police station. The news was first reported by the website Christian in Pakistan, which routinely published news regarding persecution of the christian community in Pakistan. As the news broke several people used twitter to verify the news and reach out to authorities to take action [see Global Voices report]. Mainstream media coverages followed and online petitions have been filed since. But activism aside, there have been a quite few conflicting reports about the case. The most significant one being a picture of a girl, that has become the face of the #SaveRimsha campaign. 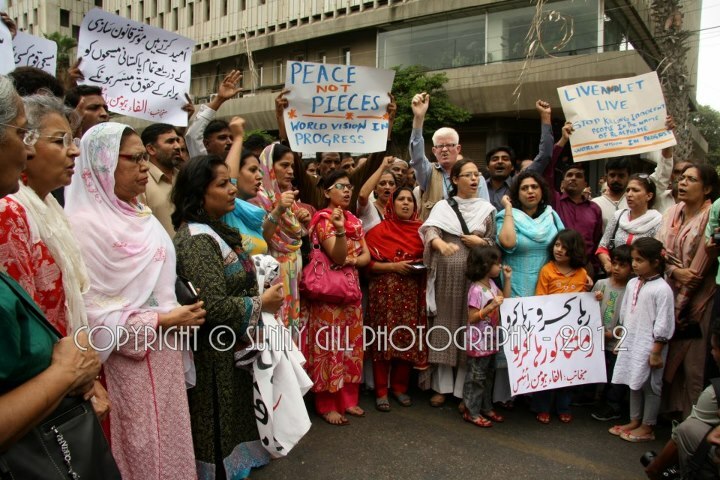 Photo Courtesy: Sunny Gill- Citizens for Democracy – People of all ages in solidarity with Rimsha, Karachi. The last report using the name Rifta was perhaps the 23rd of August. It is also interesting to note that news outlets have since corrected the name to Rimsha, but there has been no acknowledgement of the factual error in reporting; a standard rule in reporting. As numerous petitions and calls for protests appeared, many of them used picture of a little girl as Rimsha's picture. Having seen the picture of the girl being used for several campaigns in the past, I decided to do trace the picture source in order to discourage people from using the picture for Rimsha. 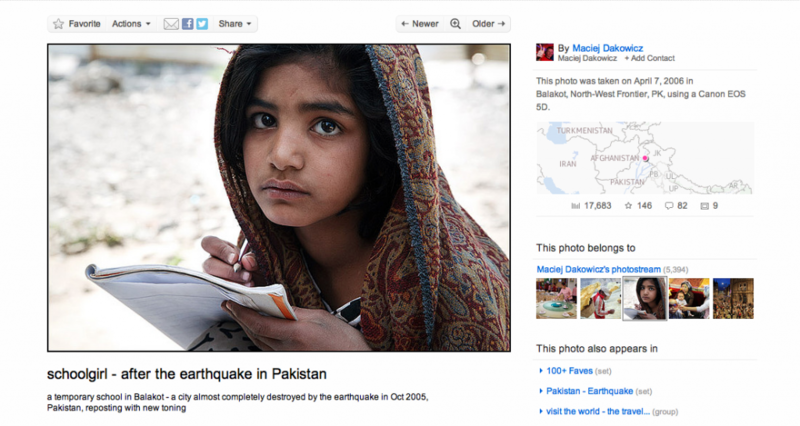 Google Images drag and drop feature was really handy to determine the source of the image, first published in April 2006 the image is of a girl in a temporary school camp in Balakot, Kashmir, taken after the 2005 earthquake (by Maciej Dakowicz). The image of the girl has also been used by reporters and websites without verification. The Examiner.com, Huffington Post and France 24 carried the picture, but Huffington post later removed the picture. @sanasaleem the author of a HuffPo article mentioned to one of my team that the pic he/she used was “some random girl”. Disappointing. Unless mainstream media outlets recognize the error on their part it will become increasingly difficult to limit the use of the picture. Given the risks involved in cases of blasphemy, publishing a misleading picture and identity can put many people in danger. This kind of laxness in reporting makes my blood boil. Really hope the person who first used the picture will not be asked to write for any news publication again. The above mentioned photo is fake & her age is above 18 year. This all propegenda has raised to just make the Pakistan & Islam’s name “Bad”…..The real story of Ramsha Masih can be read from the link below by a eye-witness writers.. http://daily.urdupoint.com/todayColumn.php?column_id=16465&page1=10&page=10&writer_id=222&date1=2012-09-06 All the Pakistani Christians are our Brothers &Sisters. We can solve the issue internally, No need to go even in any court or in the Media…….But Shame on the enemeis of Pakistan & Islam who r just spreading the rumours & lying to just make it a big Problem for Pakistan’s public.